You must have heard of the term “Natural Disaster” or “Act of God” in many contexts. In fact, the word “Natural disaster” is a misnomer. Nature loves her children and would not do anything to harm them at any cost. It is man alone, who by his selfish acts prompts Nature to act otherwise. Thus, every so-called natural disaster is actually the handiwork of man. However, for the sake of consistency we shall refer to such disasters as natural disasters. One such disaster waiting to happen anytime in 2016 is the El Nino Phenomenon. 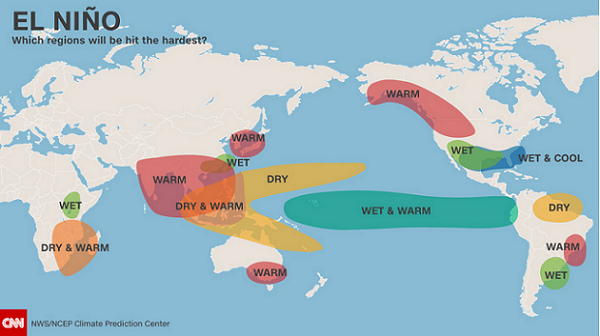 What is the El Nino? The El Nino is a climatic phenomenon. The rise in pollution and rampant deforestation is the cause of the greenhouse effect. This causes an increase in the temperature of the seawaters. This increase in the temperature of the seawater around the eastern equatorial Pacific Ocean has the capability to cause extreme changes in weather in the coastal areas and other places in the world as well. This is the El Nino effect. Usually the rise in temperature of seawater due to the sunlight in the equatorial region concentrates on the western part of the Pacific Ocean. El Nino, in Spanish means “the boy.” The local anglers invented this name to explain the hot currents around the beaches of Peru and Ecuador every year around Christmas time. Normally the rise in the water temperature should not be a matter of great concern. The temperature rises during this time and subsides sometime around March every year. However, this year has seen a dramatic rise in the temperature of the seawater over a long period of months. This is the right situation for an El Nino phenomenon. The seawater temperature in the eastern Pacific Ocean is much higher this year as compared to the other years. The El Nino is a certainty this year. This could bring with it abnormal storms affecting various parts all around the globe. This year the temperature of the seawater was a good 4 to 5 degrees higher than normal. This provides the ground for a very strong El Nino effect this year. In the normal scenario, during this period there is a flow of air and water from the South American region to Australia over the Pacific Ocean. Hence, the weather over South America would be dry whereas you can expect a lot of precipitation over Australia. In the El Nino year, the procedure is the reverse. Due to increase in the temperature of seawater in Peru and Ecuador, the flow of water and air takes place from Australia towards the South American continent. There is a huge water blanket between Australia and South America. The temperature of the seawater being higher throughout these vast areas, tend to increase the heat reserve. This can cause the El Nino effect to display its show of strength on areas other than Australia and South America. Meteorologists expect a very strong El Nino this year. The El Nino will peak somewhere around December and fade out over the next few months by April. 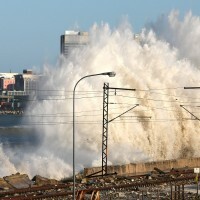 You can expect heavy rain and floods in South America. This can cause massive soil erosion and will affect agricultural activities greatly. You can expect great heat and forest fires over Australia and the parts of South East Asia. You can also expect tremendously strong typhoons in and around the Pacific Ocean bringing heavy rainfall to places in South East Asia. In fact, the first week of December saw Tamil Nadu in India, experience record rainfall and unprecedented floods. The El Nino causes warmer winters and hotter summers. This can cause the melting of the snow in the mountains. You can expect flash floods in the plains because of the heavy melting of snow. This has an effect in raising the water level of the oceans and displacement of human habitation along the coastal areas. This can have a great effect on the fishing as well as agricultural activities in such countries. There has been unprecedented snowfall in many parts of the United States this month. This is also an after effect of the El Nino. This is only the beginning. The worst is yet to come. The prediction for this year is grim. The summers could be excruciatingly longer and hotter. The winters would be shorter and warmer. This can throw agricultural schedules awry. You can expect famine, droughts, as well as floods this year in many parts around the globe. You can expect higher rainfall in places around the seacoast. You cannot fight against Nature. You have to bow down before her and suffer her wrath. However, you can take remedial measures by reducing the massive deforestation and reduce the pollution levels in the cities. In this way, you can delay the inevitable.